Lifestyle can influence your menopause experience, and many women find that a combination of herbs, exercise, natural products and nutritional support can make a world of difference. Red Clover Extract (Trifolium pratense): a rich source of phytoestrogens, particularly isoflavones. Studies have shown it to support cardiovascular and bone health, and to promote the relief of menopause symptoms. A mild diuretic, it may also help with bloating. Black Cohosh Extract (Cimicifuga racemosa): shown in several clinical studies to promote the relief of menopause symptoms. Siberian Ginseng (Eleutherococcus senticosus): supports the immune and cardiovascular systems, and also functions as an antioxidant and anti-inflammatory agent, helping to boost energy and support hormone balance. Chaste Tree Berry Extract (Vitex agnus castus): promotes relief from cyclic breast pain, and studies have shown it also promotes hormone balance. Alfalfa Leaf (Medicago sativa): a rich source of phytoestrogens and antioxidants, and has been shown to provide valuable support for menopausal hot flashes and night sweats. Dandelion Leaf (Taraxacum officinale): a rich source of vitamins & minerals, has been studied for its diuretic action that may promote healthy fluid balance in the body. Dandelion Root (Taraxacum officinale): shown in research to stimulate the activity of one of the detoxifying enzymes in the liver that may support hormone metabolism and balance. 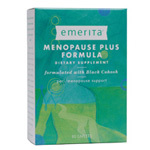 2 Emerita Menopause Plus Formula tablets daily. It may take up to 8 weeks to experience the full benefits of emerita menoplus caplets. Emerita MenoPlus is not recommended when pregnant or breastfeeding unless your health care provider specifically recommends it. Patients taking anti-rejection medications and those who have kidney disease should consult with their health care professional before use of this Emerita product.